A supply ship bound for the International Space Station roared into orbit today, promising to give the outpost's two-man crew a delivery of fresh food, clothes, equipment and special holiday gifts just in time for Christmas. 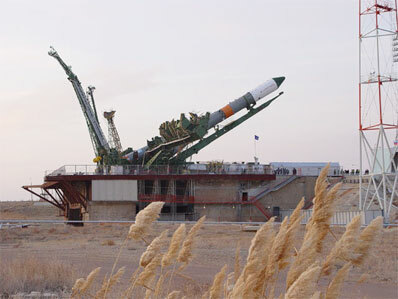 The unpiloted Progress M-55 spacecraft launched as scheduled at 1:38 p.m. EST (1838 GMT) from the Baikonur Cosmodrome in Kazakhstan. A three-stage Soyuz-U booster propelled the 24-foot long ship on a two-day, pre-scripted course that culminates with an autonomous linkup to the station's Pirs docking module at 2:54 p.m. EST (1954 GMT) Friday. The Russian-made Progress spacecraft, known in the station's assembly matrix as mission 20P, reached its preliminary orbit about nine minutes after liftoff and separated from the Soyuz rocket's spent third stage. "It looks like we've got a nominally proceeding Progress launch," Mission Control-Houston radioed the space station crew shortly after the Soyuz rocket deployed the Progress. "Excellent. Thank you," station commander Bill McArthur replied. Onboard commands extended the Progress craft's two power-generating solar arrays that span 35 feet and unfurled communications and navigation antennas. A series of precise engine firings over the next two days will guide the Progress into the station's orbit for the docking. The usual Progress parking spot at the station -- the Zvezda service module's aft port -- is occupied by the 19P freighter that Russian space officials opted to keep in place through March instead of discarding the vehicle as is typically done when a fresh resupply ship is launched. The decision allows the Progress time to transfer its remaining oxygen supply as needed and serve as a trash receptacle. The new station-bound Progress is loaded with 5,683 pounds of supplies. The "dry" cargo amounts to 3,097 pounds in the form of spare parts, repair gear, life support and equipment hardware. The refueling module carries 1,940 pounds of propellant for transfer into the Russian segment of the station to feed the outpost's maneuvering thrusters. To replenish the station's oxygen supply, the Progress is bringing 183 pounds of oxygen and air. And the vessel has 463 pounds of water. The Expedition 12 crewmembers -- commander Bill McArthur and flight engineer Valery Tokarev -- are three months into their planned half-year mission aboard the station. They will celebrate Christmas with a Russian-style menu.